The other day I wrote in this blog about the process of painting which brought a comment about appreciating the physicality of painting in person. 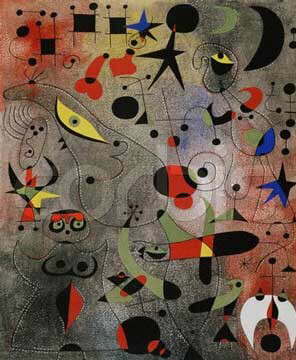 It immediately brought to my mind the paintings of Joan Miro, the great Catalan painter/sculptor. I have always been greatly attracted to his paintings having seen them countless times in books and in popular culture, such as on the cover of Dave Brubeck’s jazz classic Take Five. There was something very enticing about the imagery and the geometry of his work, something that that was symbolic and beautiful at once. However, I never wanted to know too much about the paintings, never wanted to try to read into every symbol. I just loved the way they felt on the eye. But my main memory, and the one I returned to when I read the comment about seeing the physical nature of work in person, is of seeing a Miro painting in person for the first time. When I saw it across the museum hall, I was excited. It was like seeing an old friend after a long time, even though I had only seen the work in print. But as I got closer I began to feel a dull pang of disappointment. Up close, the surfaces were flat and dull, the paint thin. It was still striking imagery but the feel on my eye was different and I left feeling a little different about his paintings. A feeling that has remained with me even though I rationally accept it as his style and have come to more fully appreciate it. I suppose it was simply the difference between expectation and the reality of actually seeing the work. As I said, I have come to terms with the way they appear up close and understand that was how he worked, how his mind best translated to his chosen media. That’s enough for me and far outweighs my own initial expectations and reaction. The imagery still stuns me. I’ve always loved Miro but never *understood* his paintings. Perhaps what I mean to say is…the many times I visited the Miro’s at the Philadelphia Art Museum (as a teenager and in my twenties, before leaving the US), I would stand by the paintings and gaze into them but I never found words or even other images. It was more like plugging in, receiving a transmission of feeling or energy, and then disconnecting. I knew his paintings from the museum setting first and only later did I find then on postcards and books. Your reflection reminded me of a similar experience I once had–but in reverse. When I was 19 I moved to Portland, Oregon for a year. While there, I saw–for the first time in my life–Ruben’s Prometheus Unbound (http://en.wikipedia.org/wiki/File:Peter_Paul_Rubens_032.jpg) in a book rather than in *person*. I was devastated! Crap! I thought to myself, now I have to visit every museum and gallery in the world! Thanks, Kelly. I have always found that painting of Prometheus Unbound a very powerful and haunting image. I was thinking more about Miro after writing this post and about what I saw in his work. It’s like seeing a strange, cryptic writing or language that you can’t decipher but you somehow understand. Ack, sorry for all the typos. Yes, “a strange, cryptic writing or language that you can’t decipher but you somehow understand.” That makes sense to me. Last year I was in Vienna and saw Klimt’s work for the first time in person and was surprised to find The Kiss a lot less vivid in person. It’s been a while since I’ve been to a museum or bummed around a painter’s studio…I’m glad to discover your blog. I like Miro paintings, mysterious paintings, many of semiotics that need to be dug up again. 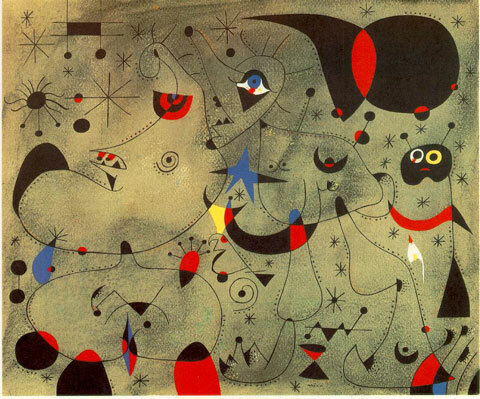 I first saw the painting in http://gallery-art.org/joan-miro-ferra.html web. after that I was looking for looking for more about Miro. I finally found on this web Miro. thank you, this website has provided information about Miro, perhaps inter-web blogroll each other. so everyone can easily find information about Miro.